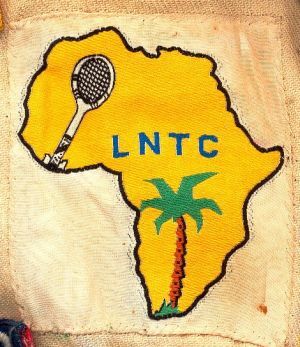 Lamco Nimba Tennis Club badge. Badge is from 1966 or before.Thanks to Eric Forsmark. Lennart Lindkvist, member and Vice Chairmanr during 1967-68 says, "I am not sure when the badge was created but it was there when I joined the club in 1966. We also organized training courses and invited some swedish professional trainers to Yekepa. Percy Rosberg later trained Bjorn Borg and Hans Olsson was the captain for the swedish Davis Cup Team during some succesful years in swedish tennis."